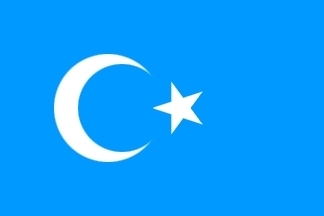 The flag of East Turkestan, Uyghur homeland occupied by China. On World Press Freedom Day 2017, the Uyghur Human Rights Project (UHRP) calls on the Chinese government to substantiate claims it is facing an unprecedented security threat in East Turkestan. UHRP challenges the authorities in Urumqi and Beijing to permit independent overseas journalists unfettered access to East Turkestan in order to assess Chinese government statements regarding unrest and counter-terror measures. "Whenever the Chinese government reports on incidents and arrests in East Turkestan, the only version of events we read is printed by outlets such as Xinhua or the Global Times. These media organizations are notoriously unreliable and any claims they make should be treated with skepticism. To ensure the world is not being fed a diet of fake news on East Turkestan, China should allow independent overseas journalists into the region and permit them to speak freely with anyone they wish without fear of repercussions," said UHRP director, Omer Kanat in a statement. Mr. Kanat added: "What is China concealing in East Turkestan that it has to monitor overseas journalists so closely? If the government says it is facing a security threat in the region, let the world's media see this for themselves. There is evidence to suggest that the real reason why China denies overseas journalists access to East Turkestan is that it would face severe criticism over its human rights record towards Uyghurs." Leading press freedom monitors have unequivocally condemned China's record on censorship and harassment of journalists. China ranks 176th worst for press freedom out of 180 states in Reporters Without Borders' 2017 World Press Freedom Index. Freedom House's annual survey of press freedom published in 2017 placed China in the "Not Free" category. Freedom House also placed China in the "Not Free" category for its Freedom on the Net 2016 report. In its 2016 prison census, the Committee to Protect Journalists documented 38 journalists imprisoned in China (of them 13 are Uyghur) out of a global total of 259. China prevents and punishes commentary, domestic and foreign, critical of the repression in East Turkestan and in particular of alleged counter-terror measures in the region. Implemented in 2016, Article 51 of the "Xinjiang Uyghur Autonomous Region Implementing Measures of the Counter­Terrorism Law of the Peoples Republic of China" forbids "spreading rumors" and "distorting sensitive cases," making or reproducing materials with "extremist content" and allows the authorities to restrict gatherings and the activities of various organizations, which may be used to control objective reporting on incidents in East Turkestan. The cases of Uyghur academic Ilham Tohti, Xinjiang Daily editor Zhao Xinwei and French reporter Ursula Gauthier demonstrate Beijing's zero tolerance for such questioning. In the case of Ursula Gauthier, Xinhua accused the reporter of using press freedom as a cover to advocate for terrorism. The Foreign Correspondent's Club of China has documented harassment of overseas journalists reporting from East Turkestan since at least 2008. China also intimidates reporters based overseas to control state accounts on conditions in East Turkestan. Three brothers in Urumchi of Radio Free Asia (RFA) reporter Shohret Hoshur were detained in 2014 and 2015 (two were later released). The arrests came after Hoshur published a series of articles on the unrest in East Turkestan that exposed vulnerabilities in state narratives and he is credited with being one of few journalists to accurately report on events. Uyghurs who speak to the media about conditions in China are routinely punished. Patigul Ghulam was arrested in May 2014 approximately a month after an interview she gave to RFA's Uyghur Service about official noncooperation in finding her son missing since unrest in Urumchi on July 5, 2009. Ghulam was reportedly sentenced in a closed trial in April 2016, and her current whereabouts and sentencing are unknown. In a 2014 report, Trapped in a Virtual Cage: Chinese State Repression of Uyghurs Online, UHRP found the Chinese state particularly employs Internet shutdowns, illustrated in the unparalleled 10-month blackout in the post-July 5, 2009 period, as a further measure to prevent the dissemination of counter-official narratives. International standards of press freedom are outlined in a series of legal instruments, including the Universal Declaration of Human Rights and International Covenant on Civil and Political Rights (ICCPR). Freedom of speech and the press are guaranteed under Article 35 of the Constitution of the People's Republic of China. The Uyghur Human Rights Project (UHRP) is a human rights research, reporting and advocacy organization. Our mission is to promote human rights and democracy for the Uyghur people, raise awareness of abuses of Uyghurs' human rights, and support the right of the Uyghur people to use peaceful, democratic means to determine their own political future. UHRP was founded in 2004 as part of the Uyghur American Association (UAA), a Uyghur diaspora group which works to promote the preservation and flourishing of a rich, humanistic and diverse Uyghur culture. In partnership with UAA, in 2016 UHRP began operations as an independent group.